Raise your hand if your dog has ever pestered you, following you from room to room with a bored face? If so, rest assured, you are not alone! 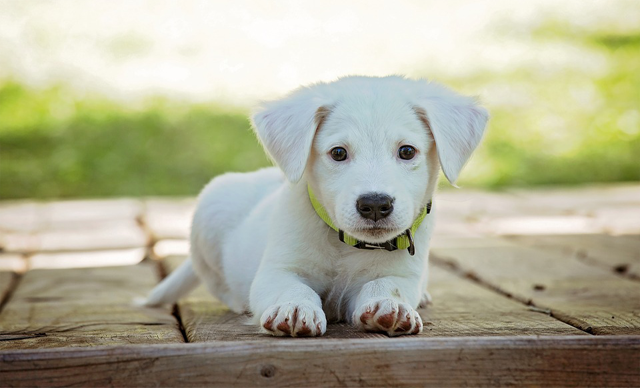 Boredom and pent-up energy are the most common reasons dogs develop behavioral problems. Most dogs living in urban settings spend a good chunk of their time alone, and the biggest perk of their day may be seeing their beloved owners coming home. This is a moment of great excitement and celebration and can often be too much to handle for a tired owner who has spent eight hours in the office. If we look at the many dog breeds that surround us, we will note that the majority were selectively bred to carry out certain tasks. We have the retrievers who retrieved downed birds for the hunter, the hounds who tracked prey with their powerful noses, the spaniels who flushed birds out of bushes, the herders who grouped cows and sheep, the livestock guardians who protected farm animals from predators and several other versatile breeds who specialized in a variety of tasks. Today, most dogs are no longer used as workers but as loyal companions who are often relegated to the yard or left at home with not much to do all day. This leaves dogs with a void to fill up. The saying “an idle mind is the devil’s workshop” fits people and dogs as well. With little left to do all day, dogs become destructive and may engage in undesirable behaviors such as digging, chewing and barking. Dogs Need Exercise and Mental Stimulation Too! When we think of bored dogs, we often think of exercise, but dogs need a healthy dose of mental stimulation too. Despite the fact that most dogs in modern times no longer live in the wild and are no longer hunting all day in the fields with their masters, they still have a strong drive for mental stimulation. This, however, doesn’t mean that you will have to quit your 9 to 5 job, purchase a rifle and go on a rabbit hunting adventure with your dog! There many great ways you can enrich your dog’s life from the comfort of your home and yard to get your dog’s cognitive abilities going. Einstein and I play the Hide and Seek game! Simple games such as Hide ‘n’ Seek (included in the Brain Training For Dogs course) will encourage your dog to engage his brain while also allowing him to get in the much needed exercise he wouldn’t have got had he spent the day snoozing in front of the fireplace. When dogs were in the wild, mealtime was quite different than what it is today. In order to eat, dogs had to hunt, which entailed sniffing, stalking, chasing and killing. Then, once the animal was killed, they had to work on separating the meat from the bones which involved lots of gnawing and scraping. Even when dogs were domesticated and no longer hunters at heart they were still scavenging for food and their life wasn’t easy. They spent a good part of their days sniffing and walking around looking for little tid bits of food. Their diet mostly consisted of carcasses left over by other predators or food left behind by humans who discarded the less appetizing parts from the animals they hunted. In any case dogs of the past, whether they were hunters or scavengers, all spent a good part of their day searching for food. This was surely a far cry from the way dogs are fed today! Nowadays, we do all the hunting for our dogs by visiting our local pet supply store. Our dog’s food comes in bags or cans which we then pour into shiny bowls ready to be gulped down, often times without even chewing! Certain brain games can help to re-introduce “hunting” into your dog’s life such as the “Treasure Hunt” game from my Brain Training for Dogs course. Brain Training for Dogs will also show you how to teach the Bottle Game, which is the simplest way to create a suppertime challenge for your dog. BTFD 3D CoverProblem-solving exercises, new tricks, or simply revamping a training session with some element of novelty are all simple ways you can keep your dog mentally stimulated. 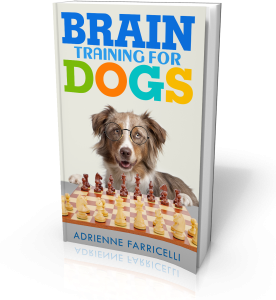 My Brain Training for Dogs course offers 21 cool brain games you can play with your pooch to exercise his brain while adding a competitive edge to keep both you and your dog on your toes (or paws should I say)! Each section has a guide to help you succeed, troubleshooting tips, and plenty of pictures so you can see exactly how to train the games. When a dog’s needs for exercise and mental stimulation are met, dogs make happier and healthier companions, so next time you think about exercising your dog, don’t forget to exercise that brain too!